I would love to know your insights on forgiveness. Do you forgive people? How Easily Do You Forgive? My answer to this question is captured in the picture bellow. Have a great rest of the Sunday. P.S. : Thank you 2.0 for picture, goes to llymlrs. « How to get enlightened during a weekend. i have learned how to forgive, but i have to admit that even though, i usually dont have a problem to forgive, i don’t forget! I guess in some cases, it is the same with me, i don’t forget. As always good Question. 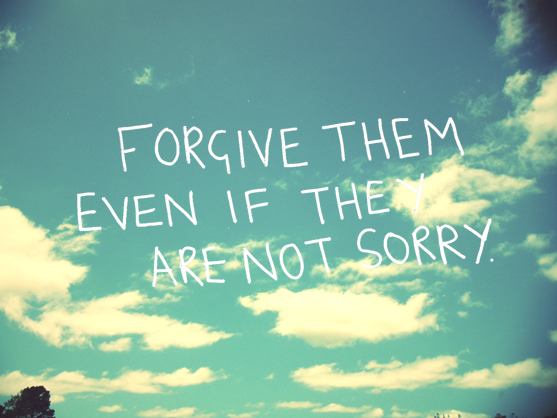 Ivana I dont know should we forgive people for their negativity? but I think its become necessary most of the time to forgive people for our inner growth. What happened last week I shared with you all I forgive that person but he seriously hurt me whenever I thought That he is from my country from my religion and he belongs to us, its really very painful. But yes you are right these negative behaviors make us more strong careful and more keen to find the area of construction in society and personality as well. 😉 smile and let it go. One can’t forget things easily but Time is the best cure. yes, it is much easier to travel the road of life without any luggage. “what you resist, persists”, i have to show this to my boyfriend, even if in different context. Forgiving is a great habit which I adopted in my teens, the sources of inspiration are/were God & my parents. Every time when you go to THEM with mistake(s) you expect forgiveness and without any explanation. And THEY do always. So I tried it too, and you know it’s a wonderful experience to forgive. You start loving yourself and find a more good human inside you. 😉 Thank you for your comment Waqas! Yes, always bring out the goodness to the world. we forgive him/her by just thinking that may be he/she bound to that. first of all thank you for your 1st comment here! I’ve found that being able to forgive allows both the forgiver and the person being forgiven to heal wounds. However, we can’t ignore that it’s often easier said than done. A lot depends on the severity of the offense. oh yes, execution of words is the tough part and letting go sometimes ain’t easy. I have developed one simple rule – I am able to forgive AND forget first time. I give people fresh start after first mistakes, because I believe in 2nd chances. But after 2nd time, I may forgive, but not forget. I am of course talking about “bigger” things. The smaller problems I am able to forgive easily, because I know people are like they are, they do mistakes and they learn. Sure 🙂 No worries, I understand, when people get busy 🙂 Enjoy your evening. do you know what first pop in my mind? To forgive takes 4 long breaths but the scarf will remain. However love is a remedy.